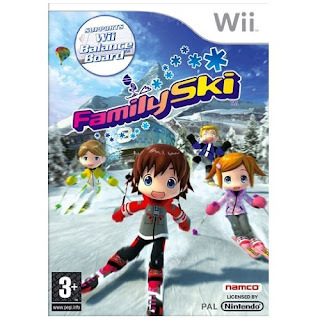 I don't think it's coincidence that two of the few words that have two 'i's together are 'Wii' and 'skiing' and the good folks at Nintendo have noticed this as well. They are currently holding a contest in conjunction with CTV to send one lucky bunch of 'i's that are part of a family on vacation to Whistler Blackcomb (one of Canada's most popular ski slopes) located in British Columbia. Better get that camera ready to take a picture of junior all decked out in winter garb looking like a character from a Robert Munsch story. The contest is a part of Nintendo's Get Up and Play promotion which encourages families to game together and share their experiences with other video game households. Teams can earn Challenge Points by performing bonding tasks like making videos of familial bliss fostered by the Wii, or a written mini-faq providing tips for different games or submitting a family portrait to show other gamers what the people behind the Miis really look like. Most activities can be done daily to encourage teams to make time for video games every day (which is something I strongly encourage). And, to round out the whole experience, families can comment and vote on each other's activities in Nintendo's virtual community. Along with the grand prize of the Ski Vacation, there are also weekly prizes to be given out to a lucky team. The contest ends November 22nd so you'd better get Ma, Pa, Grandpa, Grandma, Uncle-pa, Aunt-ma, um, Cousin Marth-a organized and snow suit up! Contest details can be found here. Who knows, soon you might be gripping ski poles instead your wiimotes.